In this Azure SQL Database presentation, Michael Fal introduces how Azure SQL Databases are still something new and not completely understood by many data professionals. There is a definite shift from installing SQL Server on a machine to creating and using a Microsoft’s Platform-as-a-Service database. This session will cover the basics of what an Azure SQL Database is, how we create one, and what it takes to access and use this database. After attending this session, you will have a solid understanding of what Azure SQL Database is, how to configure it, and how to use in your own environment. A big hurdle for using Powershell and SQL Server together is the SQLPS module. Both old and new users of SQL Server Powershell don’t completely understand its capabilities. In this session, we’ll talk about the cmdlets you may not know about, tricks to save time using the provider, and even a few gotchas on how the provider works that can save you some time and energy. 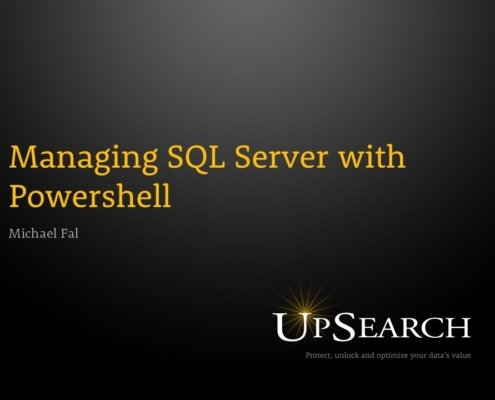 When we’re finished, you will have a deeper understanding of how you can use SQL Server and Powershell together.